"Abram and Juliette know each other. They’ve lived down the street from each other their whole lives. But they don’t really know each other—at least, not until Juliette’s mom and Abram’s dad have a torrid affair that culminates in a deadly car crash. Sharing the same subdivision is uncomfortable, to say the least. They don’t speak. Fast-forward to the neighborhood pharmacy, a few months later. Abram decides to say hello. Then he decides to invite her to Taco Bell. To her surprise as well as his, she agrees. And the real love story begins." Thoughts: First off, am I the only one who thinks the cover looks eerily similar to Jennifer E. Smith's books? Possibly a little too similar? Don't get me wrong, I love it, and it works well with the book, but I could see someone picking this up believing it's one of Jennifer's and not Jay's books. 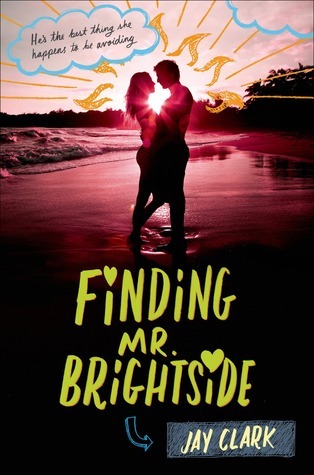 FINDING MR. BRIGHTSIDE is a unique story about two teenagers caught between the crossfires of a marital, tragic, love affair. Both teenagers must pick up the pieces and take care of the parent that was left behind. It isn't until an encounter at the local CVS that their lives start turning into something more than this tragedy. Is it possible for two people to fall in love after everything they've been through, especially with the "enemy"? The book is told through both Juliette and Abram's point of views. While both voices are distinct, both characters share similar attributes which will eventually (luckily sooner rather than later) draw them together. Of the two, I found myself pulled more towards Abram than Juliette. He's still hurt and dealing with it the best he can, but he also has this lightness to him that I appreciated. Juliette's spirit is shattered making her more cynical but still an interesting character and definitely a great contrast to Abram. I enjoyed their relationship. I loved the way it developed and the way both characters matured because of it. As their relationship grew, so did they. This made me want to root and cheer for them. Finally, something that might lift the overbearing dark cloud, even if it's just for a scene or two. The writing style is the only thing I had an on again-off again issue with. It's written well, but there were moments where I felt the story dragged a bit. It's not a very long book, yet these scenes kept me from finishing the novel faster than I originally thought I would. My favorite parts were the light moments that made me giggle and smile or the tender ones that had my heart reaching out for these two souls. Sadly, I felt like there were some filler moments I personally could have lived without. Overall, I liked FINDING MR. BRIGHTSIDE, but I didn't love it. I adored the premise and felt like it had a lot of potential, however, it simply wasn't my favorite contemporary YA book. The ending was wonderful, and I think that is mainly what kept me from giving this book three stars instead of two. I liked Abram best as well! But I do think Juliette was an interesting character to get to know too. Even though it wound up not being a favorite for me, Finding Mr. Brightside was pretty entertaining! Hãy thư giãn cùng tien len mien bac hay thả ga với Tien len mien nam và trở thành vua bài với Binh xap xam. Lovely post, Marcia. Thank you. the article is very interesting and the contents of the article is very useful once. good luck admin.